For most people, a car is their second biggest investment, the first being a home. Like most serious investments, it only makes sense to maximize the value of this important asset. 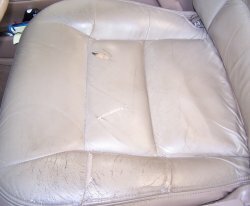 Having worn, aged, dry, or faded leather in your car is not only unsightly, but detracts significantly from its value. Many people wash and wax the exterior of their vehicle regularly, but ignore the needs of their leather interior until damage or significant wear presents itself. Most people think there are two options - seat covers or re-upholstery. Seat covers defeat the purpose of a beautiful leather interior. And, it is a “band-aid” solution at best, as it does nothing to maintain the value of the vehicle. Upholstery is often prohibitively expensive, even if you use a less expensive material such as vinyl. 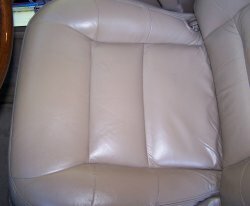 Consider us as a cost-effective answer for your automobile leather problem. We work with you to custom create a DIY solution to restore your leather interior to “like-showroom” condition. With our expert consultation you’ll be armed with the best advice. For example, in the event that certain panels of leather are beyond saving, our custom color-matched solution allows you to change the color of the replaced panel(s) to match the rest of your restored interior. Classic or collector car owners doubly benefit from utilizing our expertise and your own labor to restore your leather interior - not only is it significantly cheaper than re-upholstery, but your car will score higher at shows for having a pristine-looking original interior rather than non-original reupholstered seat or seats. For “Concours” cars that may have one area of significant wear (even to the point of needing replacement of a panel or leather section), but the rest of the leather is still beautiful with lovely patina, we can create antiquing products on a case-by-case basis to replicate that “aged but beautiful” look. In publications such as AutoWeek, that give auction information with vehicle condition, one of the most common lines written is “immaculate car, but for driver seat wear”. The difference at auction (or auto shows) between “immaculate car” and “immaculate car, but for driver seat wear” could be thousands if not tens of thousands of dollars, or a "1st place" versus “honorable mention”. We were featured in the Leather article in the September/October 2007 issue of Auto Aficionado magazine, where the main pictures used for the article are those of our work as seen here. Once you have restored your car’s leather back to its former luster and beauty, you can maintain its condition and ensure a long life for your car’s interior by utilizing the custom- engineered leather care products available from Advanced Leather Solutions. For more information, or to start the process of creating a custom-made restoration product for your vehicle please contact us via email or phone us at (800) 541-5982. We look forward to helping you bring back the beauty of your car’s leather interior. We have been involved in the leather repair and restoration industry for almost 30 years, pioneering processes and products that are based on real-life problem solving, not controlled lab experiments. If you are looking for the finest consumer leather maintenance products or DIY leather restoration solutions on the market, we not only have them, we engineered them, and manufacture them. We know them inside and out, and we know that they perform, because we use them ourselves. The same can be said of our professional leather technician product line. They are made by technicians, for technicians. Let us help you take your service business to the next level. ©2000-2018. All Rights Reserved by Advleather Inc.